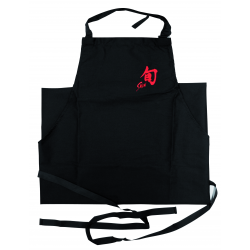 Chef's apron with adjustable neck strap and waist loop for tying.Brand: KAIColour: BlackWeight: 3.36.. The ideal high quality chef's jacket. The vest is made of robust synthetic fibre in order to resist .. Chef's apron with neck strap and waist loop for tying.Brand: KAIColour: GreyWeight: 3.36 KgPackage D..
SpecificationsBrand: KaiType: finger protectorSize: 5/ 4,5 cmMaterial: polymer..
DescriptionWith the Kai S-Knife blade protector you can store your knife safe and scratch-free. The .. Grapefruit squeezer.Material: PorcelainDimensions(length/ width/ height): 17/ 15,6/ 6,6 cm.. Lemon squeezer.Material: PorcelainDimensions(length/ width/ height): 14,3/ 12,8/ 5,1 cm..
Mortar with wooden pestle.Material: PorcelainDimensions: 10,2/ 6,2 cm..
Grater with collecting container.With two graters for ginger (fine) and wasabi (very fine).Dimension..
Julienne grater (rough) with collecting container and wooden brushDimensions(length/ width/ height):..